Sometimes you just know it’s a bad idea. Other times, you have to taste it to confirm you suspicions. There’s a small niche of the candy world made up of milk based candies. I can’t say I’m really a fan of any of it, as….it’s milk. Not quite what I’m going for when I sweet snack. But for a lot of folks…it hits the spot. 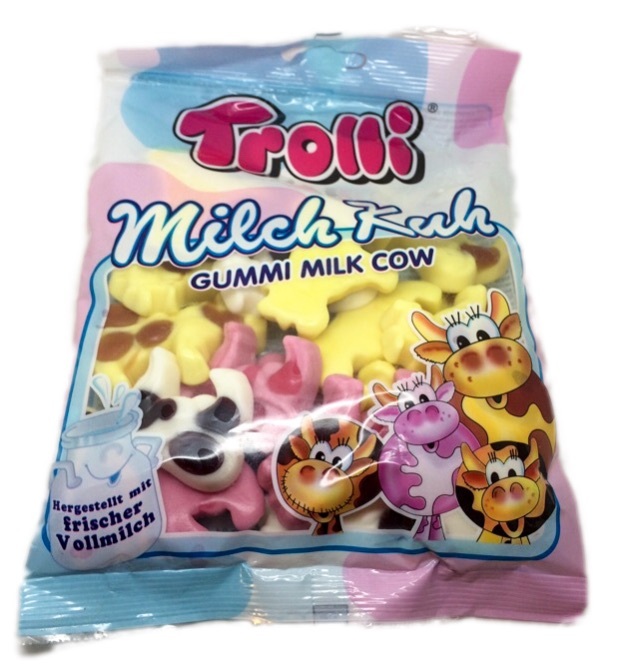 For them, I present Trolli Milch Kuh, or “milk cows” to us Mericahhns. Exactly what you suspect they are, they are: lemon, strawberry & cherry gummies with added milk flavorocity. On their website, they liken them to milkshakes with these fruit flavors. For me, it didn’t quite go down that way. I do appreciate the cow shapes, they’re fun. What’s more, I think they definitely harken a specific eating experience, which is sometimes a really neat thing for a candy to do. However, in this instance, they harken yogurt. The fruit on the bottom yogurt that I ate all the time as a kid. And while I didn’t dislike those tiny containers of lukewarm protein, I didn’t love them. These candies are sort of the same thing. Sure they taste like fruit yogurt-but that doesn’t mean I want to eat that when it’s candy time. They’re chewy, and the spots on the cows are certainly fun to gnaw off. But al the while I’m eating them, I can’t help but feel like I’d prefer….anything else at all from my collection. That’s not a good sign. However, junior liked them, and liked that they tasted like yogurt. Conversely, he hasn’t asked for them again since the first tasting. So you can see these candies are rife with existential conflict. Just use this as a guide: We’re all walking into a late screening of “Thor 4” or “Avengers 9” or whatever amazing piece of art is in the cinema these days. I grab my Red Vines, popcorn and Zours. Are you gonna be cool with lemon yogurt? Click the link below if I haven’t dissuaded y’all.